The economics of the music business continues to be highly problematic. The revenue pie for recorded music is a fraction of what it once was, and artists/creators complain that they are seeing only crumbs. At the same time music is more available - and artists are closer to their fans - than ever. As this dilemma motivated the upcoming MIT Enterprise Forum Think Tank session on The Future of Music: Where is the Money? 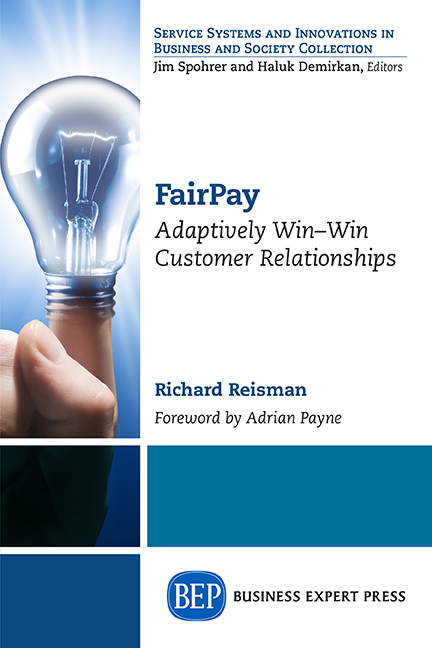 (which I will co-lead on April 16 in NYC), this seemed a good time to explore how the new FairPay monetization strategy bears on this. This post is my take on Where the Money Should Be, and how FairPay can enable that. The crisis of Napsterization has eased a bit, as first iTunes and later subscription services like Pandora and Spotify are getting many people to pay something, but business models remain besieged. At the same time, artists/creators have gained a direct path to their fans and seek to exert more power. The recent spotlight on this business as Taylor Swift pulled her music from Spotify (and Spotify's response) has shed some light on the economics, and the recent move of YouTube to add a paid service adds to the momentum toward paid subscriptions. Sales of albums, and now album or track downloads ($1 or $10 for unlimited play), had been the mainstay of the business, but the flaw in their economics is clear, now that alternatives are more available. Buying music is a good value for the user only if they play it many times. Lightly played albums are very expensive per play. Conversely, heavily played albums are a huge bargain (one that the the artist does not fully share in). The payment to the artists/creators (via whatever path) is roughly tied to sales, and so depends on how many people buy, not how much value they got (measured by how often they play it and other factors). That disproportionately favors production of pop hits over more subtle kinds of value. Flat rate subscriptions have a one-size-fits-all price that actually fits very few. Ultimately the price must be set to earn the distributor a reasonable margin on average over a widely varying user base. Some will play many hours per day, resulting in little revenue pass through per track -- or a net loss if the distributor pays rights holders a set fee per track. Others will be in a range that generates reasonable profit. Some will pay full price for light usage (for a nice profit), but many will refuse to pay the monthly fee at all, and stick with less profitable advertising-supported free versions (or piracy). For light users, the standard monthly price will rightly seem exorbitant. The irony here is that distributors earn little (or even lose money) on the dedicated music fans who should be their best customers! Depending on the subscription service, the payment to the artists/creators (via whatever path) may be based on revenue (e.g. : "streaming services" like Spotify, Rhapsody, Deezer, and MOG), or on tracks played (e.g. : "webcasters" like Pandora). If on revenue, the usage-related inefficiency passes directly to the artists/creators. If on tracks, the artist/creator is not harmed by heavy users, but still loses out on those who opt out, or makes less on "free" versions with ads. Overall, this results in a licensing structure in which per track fees to rights holders must be very low because of this economic inefficiency. They may get paid per track, but as they say, the payments are woefully small - not because the distributors are exploiting them, but because the distributors are caught in the middle with an inefficient pricing model. Neither of these current pricing models produce an economically sound result in which users pay at a level that corresponds to the value they receive. From an economic perspective, it would be far more efficient and fairer to all if users paid based on usage (with some volume discount). But usage-dependent pricing models have generally been unpopular because users fear unpredictable billing levels and nasty surprises. (A future post is planned to discuss this issue further, but consider the examples of voice and data communications services that have been oscillating between usage tiers and unlimited.) The next section will explain how FairPay can change this. FairPay promises to change the game -- primarily, by making the revenue pie bigger -- and secondarily, by making the artists/creators share of the pie bigger as well. 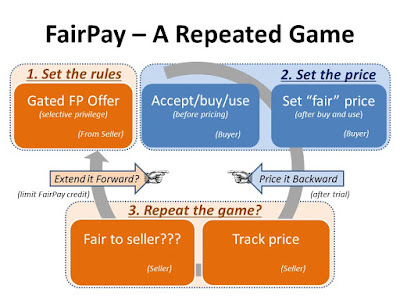 How FairPay works for music is outlined in an early post on the basics and a later one on how it can work disruptively for indies, The essence is that it enables prices to be individually set to match the value exchanged. Instead of a flat price for (a) an unlimited number of plays of a purchased track or album forever, or (b) for an unlimited number of plays of any music in the catalog per month, FairPay can track to the amount of music played in any month, and can also factor in other aspects of value, including very subjective factors. Our current models are historical accidents, caused by the limitations of distributing physical recordings for which usage was not trackable, and the limitations of mass marketing and its need for a uniform set-price per record or CD. That world has changed radically, but our pricing models not so much. This usage sensitivity alone can help the artists/creators, since they can now get paid for more plays, and by more people. But FairPay can go farther, since it enlists patrons in "dialogs about value" that center on the fairness of the price, and that fairness includes factors like how much of the price goes to the artists/creators. Daniel Ek of Spotify speaks of the need to increase transparency in this obscure area (as does the Copyright Office), and FairPay can greatly leverage the power of that. Distributors (or their artists) can disclose their algorithms for passing through revenue to rights holders, so that customers can choose to use services that most generously sustain the artists/creators who produce the music. The core of FairPay is a systematic process for building individualized relationships in which creators/suppliers are rewarded by patrons for providing value that meets their individual needs. This can work through multiple levels of the value chain, to enable artists to most effectively tune and position their work to appeal to the audience that values and patronizes them. Making it happen will take work, and experimentation -- and the entrenched powers of the labels and the licensing system and rights organizations will adapt slowly -- but there is no reason why this can't be made to work far better than our current inefficient models. This may start most easily with the indies (with their simpler business model infrastructure), and then migrate to the major labels (to the extent they remain relevant). When it is clear that most of the price goes to the artist (and the people they chose to help them produce and distribute the music), and not just into the coffers of some faceless corporation, listeners will be more willing to pay a fair price for their music. 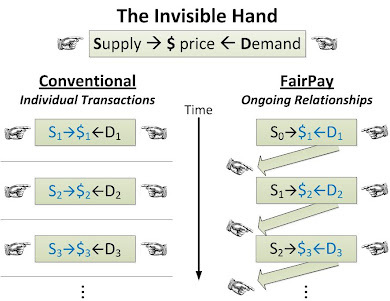 FairPay can provide a process for working with each patron to jointly find a fair price. With such a direct linkage between value creation and monetary reward, the artist can become king. *For simplicity, I refer to both the performing artists and the songwriters as "artists/creators" (or sometimes just "artists") in that both (sometimes the same persons) are creators of the music, and ultimately the ones listeners most want to compensate to sustain their creation. The industry structure treats these roles very differently, and pays them through different paths and under different rules, often through labels and publishers (who may handle most of the rate negotiations) and through a web of Global Music Rights Organizations (GMROs). I gloss over these details here, but of course applying FairPay or any other new monetization strategy will require accommodating (or changing) this industry infrastructure. I also focus on the distributors and labels as the main competitors with artists/creators for a portion of the pie, ignoring the role of GMROs as a secondary issue, but one that is still essential to getting revenue to the artists/creators. **This process can be simplified once a pattern is developed, so that a customized pricing pattern can continue automatically, with the user intervening to change it only when desired. Update: See these pleas for new business models for music in Harvard Business Review, from an ex-Rhapsody exec, and in Music Industry Blog posts here and just earlier. I really like where you are going with this. Spotify has been very successful in gaining a large share of music listeners to choose their service. While the free model does not pay the wages of musicians in the catalogs, it does create behavioral change in the direction of permanently leaving CD's and even downloadable Mp3's that need to be carried around...That consumer change is quite evident, and trends with smartphones make this direction the obvious future. Your model for Spotify, would make sense to the Premium Tier users, after they have reached a very high level of use for a set number of months--they can see they need the service at this time base, and they can see it is "their" lifestyle at stake. Thanks for your interest and opening our dialog. I look forward to collaborating as we have discussed.